Welcome to Sonosession, your complete resource for ultrasound training. We have proudly taught medical practitioner’s ultrasound scanning techniques for over a decade. We are thrilled that there is now a Midwife Sonography Certificate offered by the ARDMS. Our resources were created with this certification in mind. Our textbook will prepare you to pass the examination and our hands on and online lectures will solidify this information and give you a solid foundation for scanning in your practice. This textbook is excellent for any medical practitioner who is new to the field of ObGyn ultrasound. The combination of our online lectures and hands on instruction provide a comprehensive learning experience. We begin with the basics of ultrasound imaging, then review anatomy, image orientation, and basic scanning technique. We guide you through the non-gravid pelvis and first trimester exam including pathology and anomalies. We also prepare you for the assessment of biometry, placenta, amniotic fluid, anatomy, the biophysical profile, and multigestational pregnancies. We have hands on courses throughout the year in two beautiful locations, Monterey, California and Asheville, North Carolina. You can see the course calendar here. We also travel to facilities that have multiple practitioners that need training and provide custom hands on courses. You can read more about that here. Our team now has an on line course available for home study. You can purchase here. If you would like more information on how this works please contact us below or call directly at 831.595.2111. This book is designed as a foundational and applicable approach to ObGyn ultrasound. 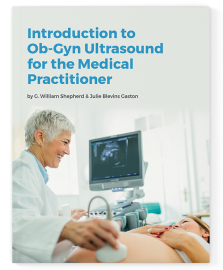 Our book has been used as a textbook for ultrasound students and can be a valuable reference for obstetricians, nurse practitioners, as well as emergency room staff. This book is being used by Nurse Midwives to study and pass the Midwife Sonography Certificate Exam offered by the ARDMS. It contains hundreds of images and illustrations. It includes basic anatomy and scanning techniques as well as fetal anomalies and their ultrasound findings.